We cannot understate the importance of marketing. Neither can we understate the value of developing a marketing strategy that is inline with your business goals. Understanding these two concepts is the first step, but actually putting them in action can be something else entirely. Developing high quality content on a consistent basis is difficult for many small- and medium-sized business owners. It takes time, effort, and money (one way or the other, you are always paying for marketing). That’s why you have to find ways to ease your burden by making things easier and more efficient. One of the most powerful tools you can use is a marketing calendar. Don’t just take our word. Here is another great blog about what a marketing calendar can do for your business. A marketing calendar gives you an outline of the content you need to develop and a date by which everything needs to be published. This allows you to effectively plan how to use your available resources so you can stay on task and work more efficiently. Define short- and long-term goals – a marketing calendar is a map guiding you along. To be successful, you need to know where you are going. Defining your goals gives your marketing calendar structure as well as way to measure your progress. Understand how each piece of content fits into your marketing strategy – save time and energy by only developing and publishing content that helps you get closer to achieving your goals. We call this “marketing with intent.” Being intentional with your marketing efforts reduces wasted time and efforts developing content that does not move your business closer to meeting your goals. Know your audience and their needs – speaking of your audience, make sure you know who they are, their pain points, and how you can address them. This makes the process of determining which content to develop and publish much easier. Know to Which Platforms You Are Publishing Content – You will want to publish content where your audience gets their information, so you have to know your audience. Otherwise, you run the risk that it won’t be seen. Knowing the platforms you need to use for distribution will tell you the types of content you must develop. Detail Your Assets and Capabilities – Before you develop any content, look at your marketing assets. This includes images, videos, and any previously-used content. It also means analyzing branding material to ensure you use the correct logo, colors, font, tagline, or any other factors that identify your brand. Having these things ready will save you time and frustration. Outline Any Upcoming Events – if you run promotions, host/sponsor events, or take part in any local event, promote your organization’s involvement by noting the dates. This will give you proper time to develop promotional content to be used in messaging. Start small by planning one week at a time. Once you get in the groove, go on to two weeks, then a full month, and on up to six or twelve weeks. We do not recommend going past twelve weeks unless you are very confident in your annual business and can predict what you will need three months in advance. You will also have to have the help to set up the calendar and develop the content for the next three months at one time. A marketing calendar is a useful tool that helps you visualize what needs to be done, what resources you need, who is responsible for developing the content, and when it needs to be completed. In time, it will become an indispensable part of your process! 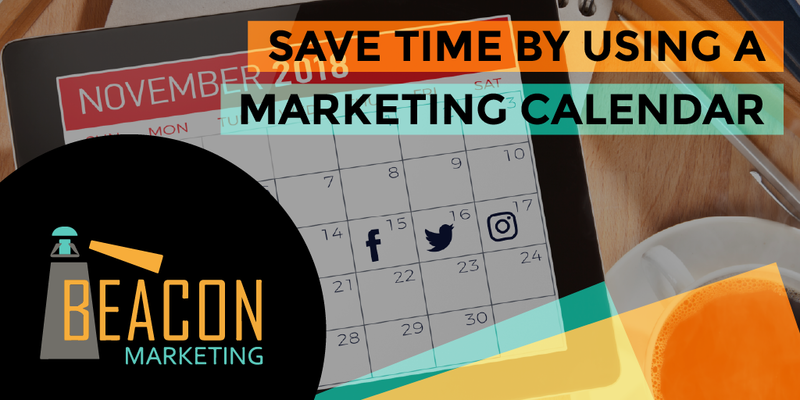 For help developing your marketing calendar schedule a FREE 60 minute consultation with Beacon Marketing today!